I tore my shop apart today. The little window circled in red is a cubby hole for my miter saw. Essentially, I'm making a station for my 12" SCMS but I don't want to give up the 24" (or more) of depth that such an installation typically consumes. Since the other side of this wall is merely the back corner of the furnace room, I decided to sink the saw halfway into the wall. 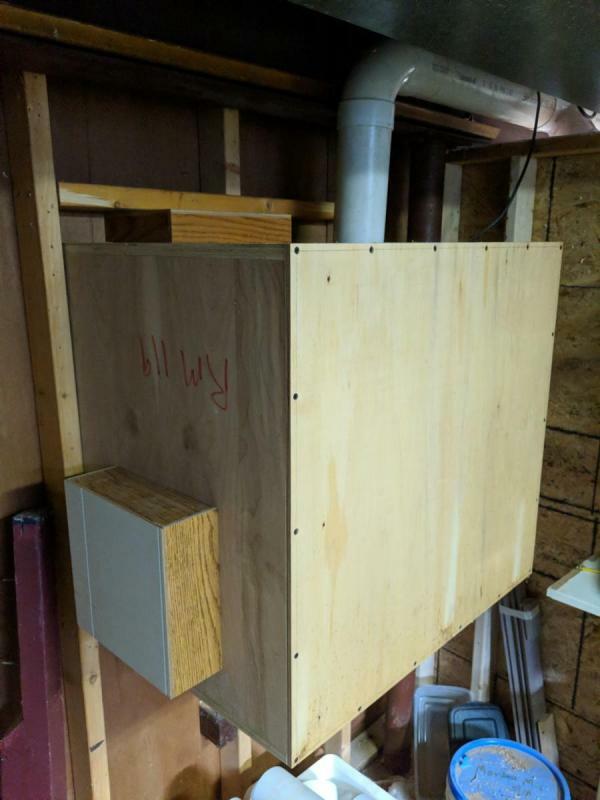 Build a large plywood box with a hole for dust collection, frame it into the studs as a pass-through, then cut out the 1/8" panelling with a laminate trimmer. Still needs a back and an electrical box, plus some tables on either side. 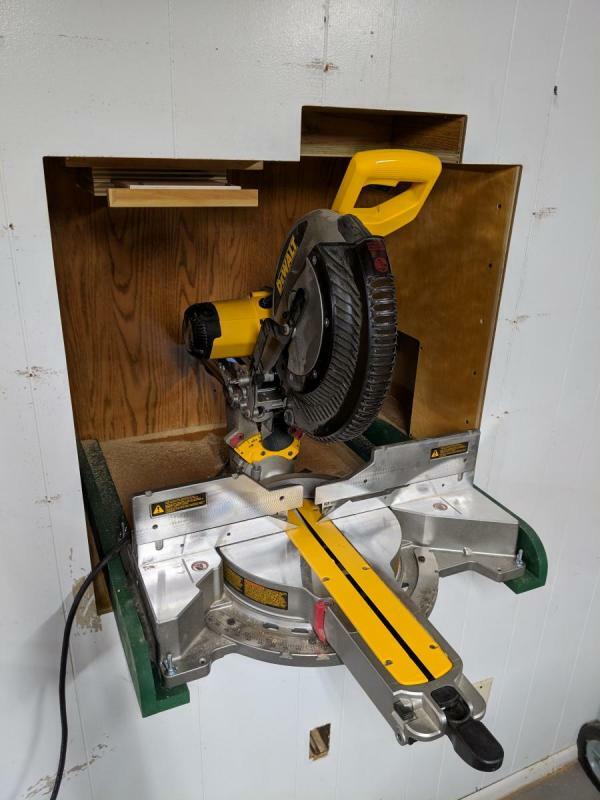 But the initial results look like a major improvement: Between demolishing the old cabs that were here and not having to have my miter saw stand out on the floor, I'm trading a little bit of wasted space in the utility room to liberate about 30 square feet of shop space. Of course, this all meant taking half the shop and piling it on top of the other half just to get access. Things always seem to get worse before they get better. Great solution to age old problem of shop space. Hope it works out for you. That's thinking outside the box or maybe in the case back inside the box. I will be interested in seeing it in full operational mode. And it's in. The saw is cantilevered out such that the plane of the saw's fence is 2" forward of the wall. The various protuberances are to accommodate the handle and the back end of the saw as it swings to 45 degrees. Yes, it's a monster of a saw. The width of the box is limited by the spacing of the wall studs. 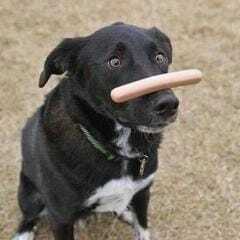 No, it's not a load bearing wall. Yes, I could have taken out another stud and made enough room to build a box wide enough for the saw's full range of motion. Yes, I did feel dumb when I put the saw in the box and realized it needed more room to swing. No, I wasn't going to remake the box at that point. Lessons learned: A 12" sliding compound miter saw is insanely heavy and unwieldy machine. This replaced a 10" non-sliding saw that I lost in the move back in 2014. With the clarity of hindsight, I probably should have stayed with a 10" saw and I'd probably still be perfectly happy. I'm glad to have this thing fixed in place as a stationary tool and have already concluded that I should acquire a second chop saw--a much lighter and less expensive 10" or perhaps even one of the 7.25" jobbers--to drag around the house whenever I need to install molding. Now that the box is hooked up to DC, does it do its job? I buzzed some scraps down to fireplace size just to test and the initial signs are very promising. I still need to come up with some adjustable panels for the front that will focus the air flowing around the blade. But, even with the front of the box wide open like this, no debris is escaping forward. I anticipate needing to vacuum out heavy chips that fall inside the box and that's OK. The whole point of the exercise is to surround the saw with a flow of air that will coax the nasty little fines into the cyclone. With that, I need to start excavating the wreckage of my shop and putting stuff back in order. Enough making things worse. Time to start making them better. I did something similar with my SCMS, only I have it sitting in a compartment built into some shelves. The saw sits on a base that has heavy duty slides so I can push it back fully out of the way. There's an 8" duct running from the collector into the top of the compartment. Nearly 100% dust collection.